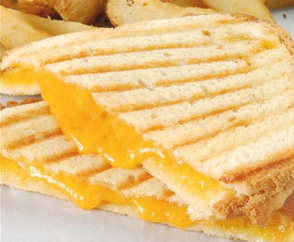 What could be better than starting the day off with this deliciously hot cheese & broccoli grilled sandwich? You can even add chicken breast deli slices for an easy protein boost. Chop up the broccoli into tiny pieces and add in with 2 tbsps of butter in a frying pan. Mix well. Slice up the garlic and onion and add with the broccoli in the pan. Cook until all the vegetables get nice and tender. Just as the broccoli is about done, throw in 2 shredded slices of chicken breast meat. Mix well. Spread a little butter on the outside of two slices of bread. Add the broccoli and cheddar filling and close the sandwich. 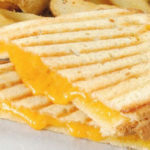 Place the sandwich on the grill and close the lid, cooking for 3-5 min, or until it is nice and toasted. Tried this today. Excellent recipe!